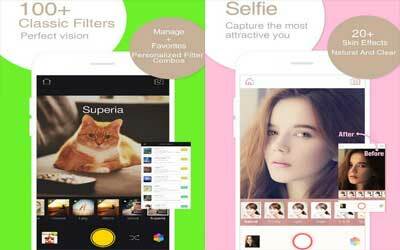 Previous version Camera360 Ultimate 8.6.4 apk for Android will help you to downgrade or install older app easily. This is one of the best Photography apps. It is easy to find the smart phone which is completed with great camera feature but sometimes it will not be enough for creating the best image result. Sometimes people need to make some adjustments on the picture they snap. With very rapid improvement of the apps which can be used for smart phone device, it is not difficult for helping people to find the apps which can be used for editing photos. One great app of photo editor which people can use is camera360 for Android. It is not only useful for helping people edit their photos because they will also be able to find many features which are fun and unique for creating much funnier photos. Live adjustment to the photos can be made by using this app as people are taking the photos. People can simply snap a photo and then they are able to apply the filters as well as other effects. However, with so many features which can be found on this app, people should meet the problem associated with the interface of this app. People will find the menus number which is overwhelming so people will be disoriented even with several hours experience with this app. People will not find satisfying tutorial or instruction. [New] Dynamic rhythm stickers are here, move and groove to the beat of music; fun and exciting! [Optimization] Optimized camera process for shooting and recording videos; for a much smoother experience. Allows good clean shots to be taken, very easy to use. Amazing efficiency for a photo editor on a phone.